Your registration fee goes to providing items including game uniforms, shoulder pads, practice equipment, field rental fees, league administrative fees, referee fees, etc. What do I have to provide for my child? Parents will provide their child’s equipment of a more personal nature. This includes their helmet, practice pants, practice jersey, cleats, socks, protective athletic cup and mouthpiece (must be a colored mouthpiece, not clear). Click here to view the suggestion shopping check list. Additionally, each parent must provide their child’s coach with a valid Maryland Identification Card. This identification card is used to identify each child during weigh-ins prior to each game. It is obtained from the Maryland Motor Vehicle Administration and turned in to your coach or team mom by the end of the second week of practice. The card will remain in the coach’s possession until the end of the season. This is a firm requirement for participation and is a rule established by CCFL. Your child will not be allowed to participate in league games without it. We highly recommend obtaining this identification card for your child as soon as possible. The instructions on how to obtain a card are located here: (http://www.mva.maryland.gov/Driver-Services/Apply/id.htm.) The MVA no longer has the ability to print ID cards or learner’s permits locally. These products are now being issued through a central print farm and are mailed from the MVA headquarters in Glen Burnie. It will take approximately 2 weeks to receive ID cards once you have gone to the MVA to apply. When does practice start? How often will we practice and where? Equipment hand out will be on July 24. Mini Camp will be July 25-26, 2019. Full pads practice begins July 29, 2019. During the month of August and until school begins, practices are typically held 4-5 days per week, Monday thru Friday from 6:00 pm – 8:00 pm. We will also schedule scrimmage games to help prepare for the season and they will be played on Saturdays. After school begins, practices will be reduced to 3 days per week. Specific practice days will be determined by each team’s coach before the school year begins and may vary depending on field availability. The first game for the 2019 Season will be on Saturday, August 24, 2019. CCFL releases game schedules in the summer. The regular season is typically 9 games long. 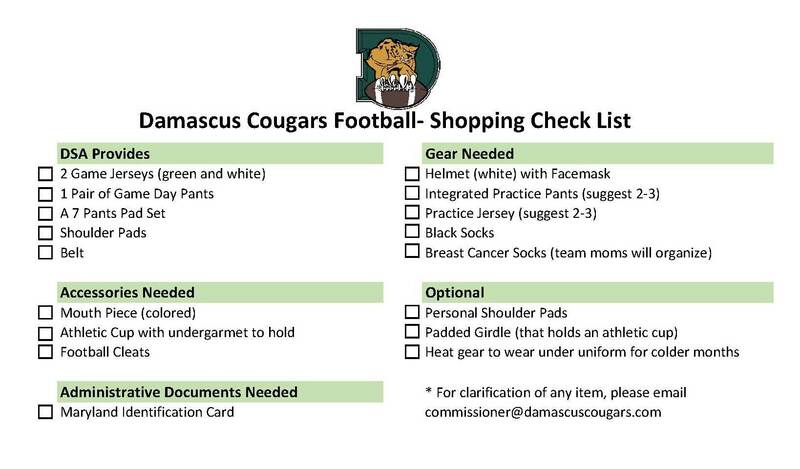 Our home field is located at Damascus High School. Away games will take place in Howard, Carroll, Montgomery and Baltimore counties. Directions will be provided. What are the DSA Football Policies and Procedures? To view the DSA football policies and procedures click here. Send comments to DSA football commissioner at commissioner@damascuscougars.com.